Why was O Gaas in every Temple? Hypothesis: Norse, who had a warm and affectionate relationship with the Virgin Mary, walked over the ice from Greenland and over time integrated their language and cultural customs with native Algonquin American peoples. If so the Algonquin Americans along the seaboard (Lenape and Shawnee) may have been Christians before Europeans came. The image above was originally painted by John White during the 2nd English voyage to America in 1585 and reporduced in an engraving by Theodor De Bry in 1590. 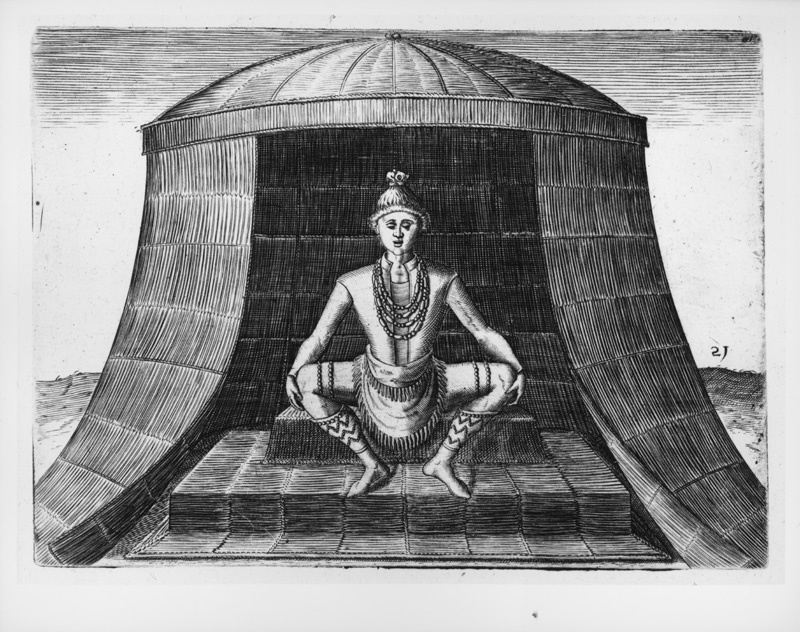 Thomas Herriot reported that this image Kewas" was found in "homes or … temples." The word "Kewas" in Lenape means "Mother." A "Mother" in a temple is reminiscent of "Blessed Virgin Mary; Mother of Jesus." The Catholics in France had the Virgin Mary in every church. The Catholics in America may have had the "Mother of Jesus" in every temple. John White was NOT a candid camera photographer. Everything he painted appears to have been carefully staged to incorporate the maximum amount of information. The two women shown below illustrate White's attention to detail. The two women have tattoos, but White may have thought that the more important features were that the faces and bodies might have been similar to English. White may have asked the woman to put her hand through the beads so a viewer might notice that the beads might have been used as rosary beads. The "Han" crosses are painted with just enough detail so that Catholics in northern Europe may have recognized them as Crosses, but White painted with just enough vagueness that most English people would have believed that the pendants were not Catholic crosses. In England "crosses and other antiques" including rosary beads identified a person as a Catholic. White's queen, was Elizabeth I. Will Durant reported that Elizabeth I had once ordered a group of Catholic men to be hung until they rotted away. Did John White carefully present pictures to men who hated Catholics like their Queen? Most of the military men on the voyage may have wanted to believe that the strange Americans were pagan. That belief made beheading the Americans, which they did, an action without remorse. The military commanders may have reported their beliefs to Queen Elizabeth along with the advice that the English should take the land away from the ignorant pagans. If White had painted the Americans so they appeared to be Catholics, his paintings might caused even greater harm to them. But he painted the Americans to look like religious people. He might have hoped his Queen would avoid the tragic mistake of thinking that the Americans were ignorant pagans. Queen Elizabeth may have understood. After she read Harriot's report with White's paintings included, no official English voyage returned to America during her reign. Even Walter Raleigh, who had originally received the Virginia Charter from her, was asked to sail to Spanish South America. King james I may have known about the presence of Christians in America. He put into his charters a clause that said the English colonies could not settle on Christian lands. Ivor Noel Hune describes in The Virginia Adventure how heavily armored men waged a war(1610-1613) to secure the English foothold in the Chesapeake Bay. Those brutal men apparently chose to ignore King James' clause. 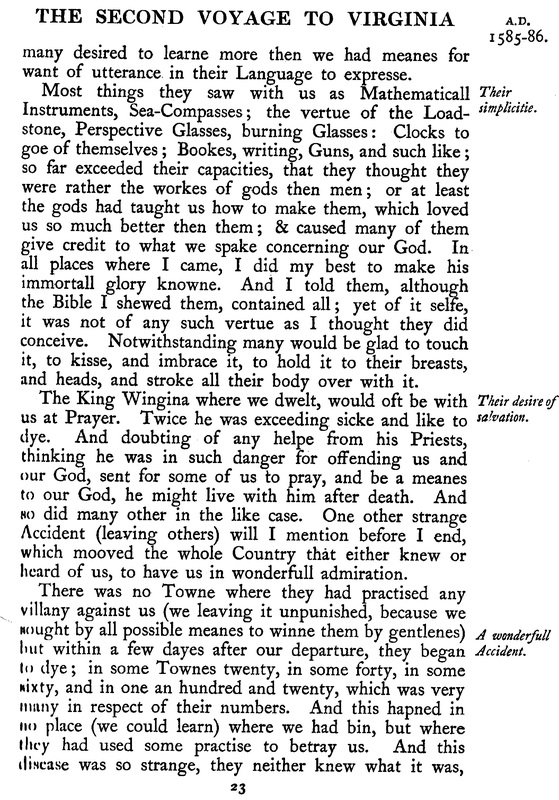 Hume records that the armored men stood with awe in front of a temple. Then they burned the temple and marched on to burn the next village, and the next, etc. 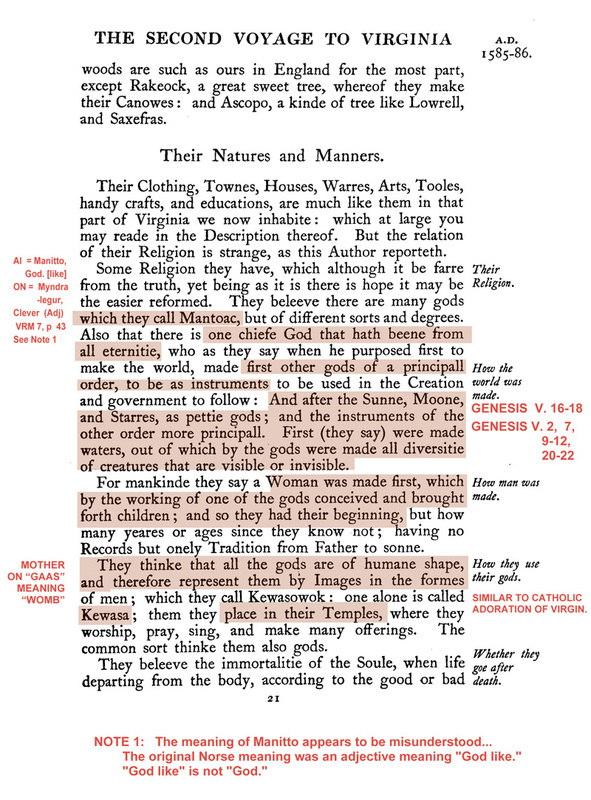 So, at least, a few of the brutal English men knew the Lenape were not pagans. John Smith in 1628 copied Thomas Herriot verbatim but, apparently, Smith, a military man, did not reflect on Harriot's words. Annotated pages from the text of Captain John Smith: Writings with Other Narratives of Roanoke, Jamestown, and the First English Settlement of America, by Capt. John Smith and edited by James Horn. 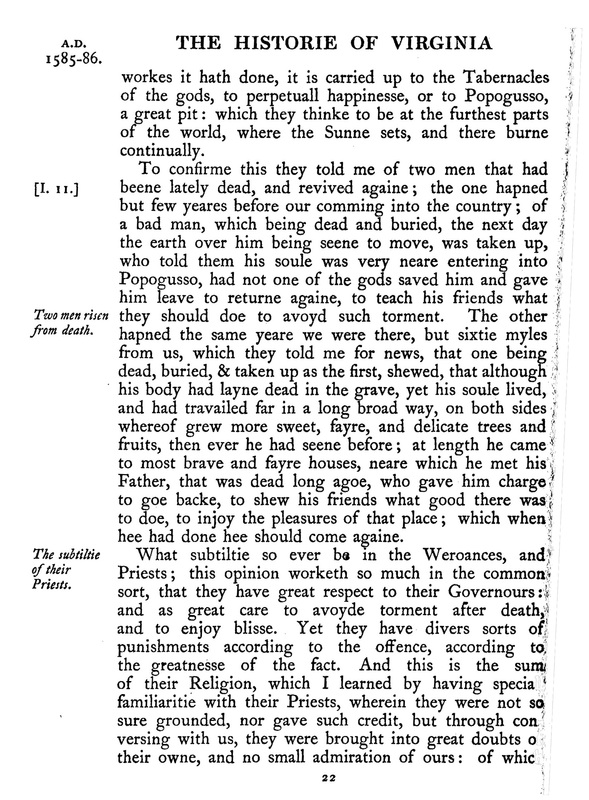 This section is taken from the Second Voyage to Virginia by Arthur Barlowe which may have been copied from Thomas Hariot. "The Algonquin Indians have perhaps a more extensive mythology than the majority of Indian peoples, and as they have been known to civilization for several centuries their myths have the advantage of having been thoroughly examined. (....)"
".... This tale is surprisingly reminiscent of the Scandinavian myth of Balder, who would only die if struck by a sprig of mistletoe by his brother Hodur. (....)"
"But although Maslum was slain he subsequently appears in Algonquian myths as Lox, or Loki, the chief of the wolves, a mischievous and restless spirit." "(...) there are many points in common between the two systems, as we shall see later, and among them few are more striking than the fact that the Scandinavian and Algonquian evil influences possess one and the same name." "Malsum tried to find out what could kill his rival [Gluskap] and in jest asked him what could kill him, adding that only fern root could cause his own death. Gluskap replied that an owl feather was the only thing that could slay him. So one evening Malsum took the feather of an owl's wing and used it in place of an arrowhead to shoot his brother. Gluskap fell dead but immediately after, by his great magic, he recovered. Suspecting his brother's treachery he went into the forest and sat by a stream declaring that only a flowering reed would kill him. A toad hearing this hopped away and told Malsum the secret, asking for the power to fly. But Malsum refused to give the toad the power of flight, and said it would look silly with wings. To be revenged the creature hurried back to Gluskap and told him of his danger. Gluskap thereupon plucked a large rooted fern stem. With it he struck down Malsum and killed him, driving his evil magic below the earth. Malsum was unable to revive, he became a cruel and vindictive wolf." "Since the Algonquin Indians were trading with the Norse Vinlanders for four centuries and more before Columbus this story possibly has some echoes of Norse mythology." Comment: Burland admitted that the Algonquin myth is similar to the Norse myth. He understood that cultural transfer takes time, so he mentioned "four and more centuries" of trading between the Algonquin and the Norse. Thus his need to explain the similarity of the myth forced him to the outer limits of conventional wisdom about trading between Algonquins and Norse. Conventional wisdom is that the Vikings, if they came at all, left America in c1015, never to return. In 1985 no educated person risked their reputation to write that the Algonquins were descended from Norse.